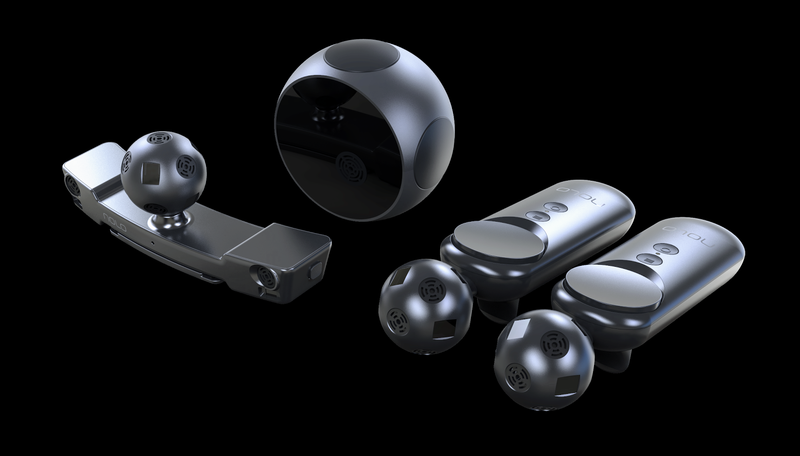 Nolo can add roomscale VR with motion controllers to any mobile VR headset, and it is also incredibly affordable. Current mobile VR headsets (Samsung Gear VR, Google Daydream, and Google Cardboard) are limited to head tracking with 3 degrees of freedom. You can move your head in any direction but it cannot track your forward-backward, side-to-side, or upward-downward movements. Meanwhile, desktop VR systems (Oculus Rift, HTC Vive, and Playstation VR) have positional tracking with 6 degrees of freedom, but they cost much more. Nolo by LYRobotix helps to bridge the gap between mobile VR’s affordability and desktop VR’s more sophisticated tracking capabilities by adding 6 degrees of freedom to any mobile VR headset. 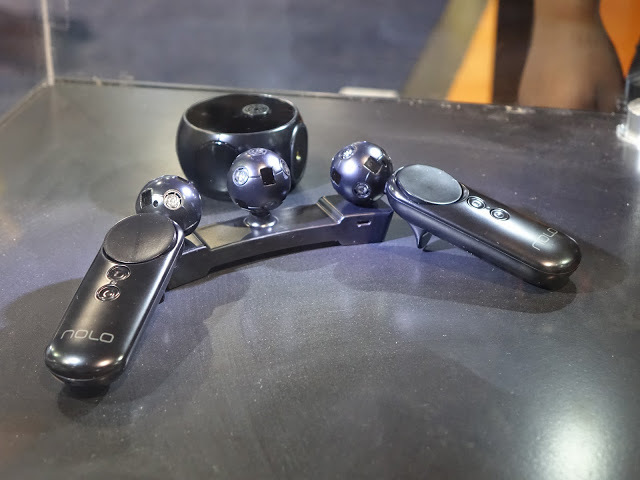 Nolo consists of a base station, a head tracking unit and two motion controllers. It uses a combination of ultrasonic and optical tracking and RF signals to track the headset and two controllers in a space up to 13 feet by 13 feet (even larger than the tracking area of a Playstation VR). I tried Nolo at CES 2017. The system was not working smoothly because of radio interference from the many wireless devices transmitting simultaneously on the show floor. 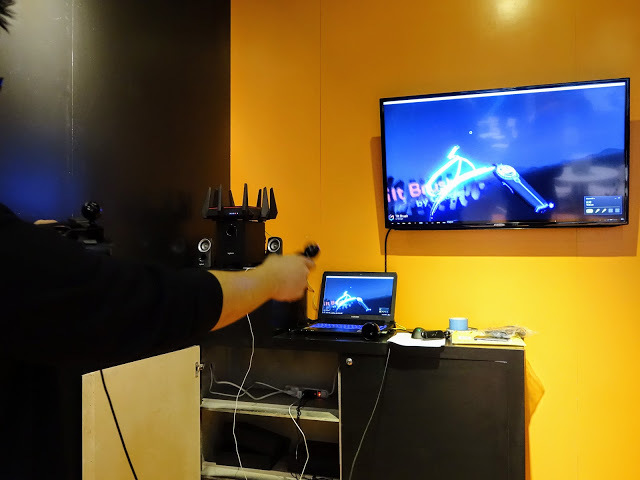 Nonetheless, it did add positional tracking and the motion controllers did work, although the positional tracking had a lot of lag compared to desktop VR systems. So for example I could turn my head and there would be no issues with head tracking but when I crouched down, there would be noticeable lag before the perspective changed. But overall, it worked. And like I said they warned me that the system wasn’t working well because of the interference. According to COO Lisa Zhao, when there is no interference, the system works much more smoothly. The videos below are representative of the actual performance, according to Ms. Zhao. Nolo is working with developers to create games for Cardboard that utilize Nolo’s tracking system. However, in addition, it is possible to connect the headset to a PC and play Steam VR games. I was able to use a tethered Nolo to play Tilt Brush (on Steam for HTC Vive). The complete system with base station, head tracking unit, and two motion controllers will cost just $99. It will be available on Kickstarter on January 20 for an early bird price of $89. Although the tracking was not as accurate as any of the desktop VR systems, and desktop VR users may scoff at the Nolo, its aggressive price point is going to make roomscale VR accessible and attractive to a far greater number of people, and there is a good argument that a product like this may be exactly what the market needs. It is really unbelievable that Nolo adds roomscale VR to mobile VR headset at this rate. What if we get VR Headset for iPhone at this price? The complete system with base, head tracking unit and two motion controller will cost merely $89!